shelter supplied by UNICEF, students would have been sent home on a rotating basis. 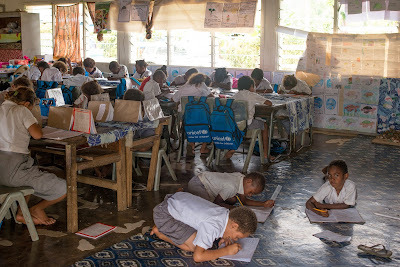 Three months after Category 5 Tropical Cyclone Pam hit Vanuatu with devastating force, Vila North School is a study in contrasts. Children released for break scream with delight as they scamper from tents set up as temporary classrooms, past the destroyed parts of their school. 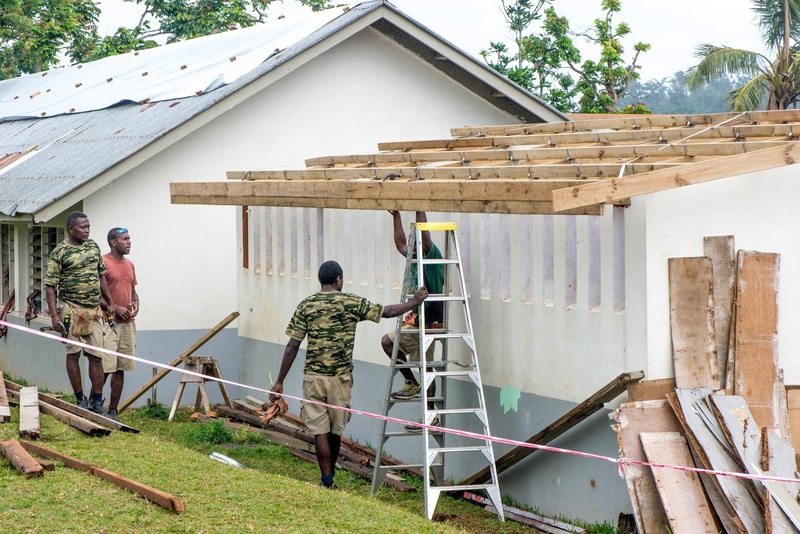 Builders work around them, replacing the roofing on classrooms and rebuilding destroyed facilities as teachers plan their lessons from a temporary office inside a repurposed shipping container. Students and teachers can see the progress around them – but much remains to be done. Mr Ronald, the school’s Director, smiles as he surveys the playful chaos around him; fun, laughter and smiles mean his students are well on the road to emotional recovery. It’s been a tough few months for everyone in his community, Cyclone Pam affected more than half of Vanuatu’s population, including 82,000 children, also bringing significant damage to neighbouring Tuvalu, the Solomon Islands and Kiribati. More than half of all primary and secondary schools in the storm’s path were damaged, badly disrupting children’s education. When Mr Ronald came to check on his school as soon as the cyclone had passed he couldn’t believe what he found. The administration block had been destroyed altogether, three classrooms and their library had lost their roof and two toilet blocks had been badly damaged. “I didn’t know how we would be able to welcome back our 710 pupils” he recalls. agencies, the school would have been forced to close. leaving the education of hundreds os students in doubt. He also wasn’t sure if the children would ever be able to overcome the traumatic experience of the cyclone. When school resumed he and his staff decided to give time to the children to help them to process their experiences during Cyclone Pam. “It is all we did with the children, for the first week or two; we offered them a safe place to share what they had experienced, hoping it would help them recover from the cyclone”, he says. Vila North School became a place where children could discuss, write and draw about Cyclone Pam, sharing their fears, hopes and anxieties and finding strength in community. In addition to its buildings, the school, like many others, lost precious learning materials and supplies. UNICEF provided Vila North School with a ‘School-in-a-Box’ supply kit full of educational materials, and two 42m square metre tents for temporary learning spaces. “The children find it fun to have their classroom in a tent. They actually like it!” says Mr Ronald. 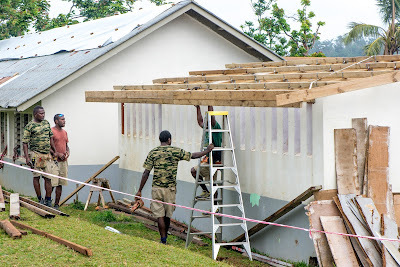 The school also received UNICEF tarpaulins to provide temporary shelter for the damaged classrooms and library, and the UNICEF ‘Office-in-a-Box’ (a container filled with basic office furniture) is allowing Mr Ronald and his staff to work and plan for their students’ needs. providing an education for hundreds of children. Mr Ronald was also worried that his students wouldn’t have the supplies they needed for learning; too many of them lost their school supplies in the cyclone. To make sure children weren’t disadvantaged by this, UNICEF also supplied school backpacks full of learning supplies, allowing children to get straight back into their studies, complete with a new blue schoolbag that most seem to wear with pride. And while study is important, play is too. UNICEF provided Vila North with recreation kits; big boxes full of games and activities for children to play and relax with friends, supporting their emotional recovery. 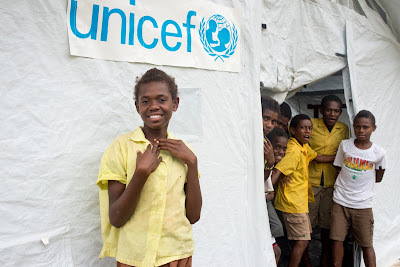 In the three months since Cyclone Pam hit Vanuatu, UNICEF has supported 17,700 children in Early Childhood Care and Education Centres and primary schools across the country by supplying temporary classrooms, learning materials and school supplies. Approximately 100 key pre-school teachers, primary school teachers, primary school principals and zone curriculum advisers have also been trained to support the emotional recovery of affected students.